As you may know, the bottled tea is very popular here, but Japanese people don’t make tea at home as much as we used to. If not tea geek, people don’t drink green tea a lot. On the other hand, I’ve known (of) some “non-Japanese” who love Japanese tea and work as an expert in Japan. They include people who manages an internet tea company, who work at the Japanese tea organization, and who work as a master of Sado(Japanese traditional tea ceremony). In addition to their deep knowledge and their love about tea, their Japanese (language-ability wise) are amazing! Once in a while I feel that they know more Japanese words than I do. There are more non-Japanese who involved in Japanese tea field although I haven’t met them yet. Recently, we sometime see the very interesting scene here and there. Japanese people attend the seminar or the lesson about Japanese tea hosted by a non-Japanese teacher. While listening about Japanese tea told by non-Japanese teacher and tasting some Japanese tea made by non-Japanese instructor, Japanese people are impressed by the taste, and surprised to know the taste of tea can be changed according to the brewing way. 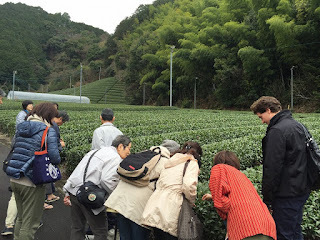 Actually, I’ve attended Sado class hosted by a Canadian tea master, and I learned a lot. Anyway. it is very happy to see that Japanese tea have come to attract the world, which we never dreamt of it.